I’ve been reading quite a bit in 2013, including some books on astronomy. In the next few weeks, I’ll take a look at some volumes currently on my bookshelf and assess them for readability by the general public, for amateur astronomers, and possibly, science pros. I like a good book with information and that assumes some intelligence on the part of the reader. The Brightest Stars fits the bill. It’s accessible by a middle-schooler with a deep interest in astronomy, and contains some good bits for the seasoned adult skywatcher. Fred Schaaf is a long time amateur astronomer, multi-book author, and columnist for various magazines. He gives the reader one-third of the book with background on stars. 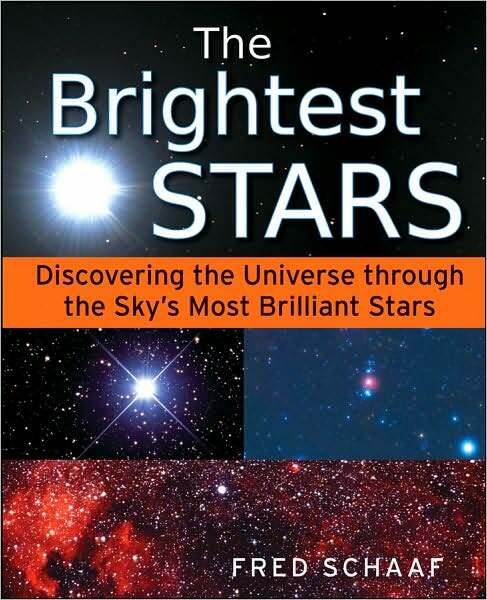 He devotes the final two-thirds to twenty-one profiles of the brightest stars as seen from Earth. My favorite part: tracking the movement of stars through the sky over hundreds of thousands of years. Did you know that 420,000 years ago, Earth had two very bright stars marking the north pole in the sky? The so-called fixed stars revolve around the center of the galaxy. But some stars aren’t following the same path as the sun. They “fly” into our neighborhood quickly and leave–all on the time scale of a million years or so. Mr Schaaf includes personal anecdotes–good color. He gives both mythical lore and scientific history on our twenty-one stars. Also fascinating stuff. I appreciate the attempt to appeal to those with interest in science, history, and culture. He hits on all of that and held my attention. My only quibble with the book is that it’s not well edited. Sometimes there’s too much repetitive information given, and it comes across as filler. Maybe editors leave veteran authors alone by their thirteenth book. Too bad. A good editor would have turned this B-plus book into an A. This entry was posted in Astronomy, On My Bookshelf. Bookmark the permalink.